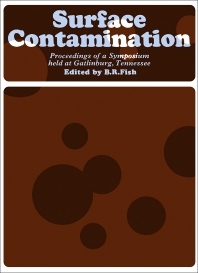 Surface Contamination presents the proceedings of first International Symposium on Surface Contamination, held at Gatlinburg, Tennessee in June 1964. The meeting discusses the potential hazards brought about by noxious contaminants on surfaces; the effects of contamination to human health and safety; and the integrity of scientific and technical machinery and products in meeting the exacting requirements. The book contains the work of experts from different technical and administrative disciplines. Areas covered include fundamental research on redispersible and evaporable contamination, including radioactive, biological, chemical, and abrasive contaminants. Administrative and technical problems on radioactive surface contamination control criteria; measurement techniques; environmental control of surface contamination; dissemination of airborne microorganisms; radioactive contamination control applications; biological and chemical surface contamination; insurance and economics; and decontamination are tackled as well. The text will be a good source of information for ecologists, environmentalists, chemists, biologists, students, and policymakers. Practical Aspects of Surface Contamination Control at A.W.R.E. The Decontamination Service at A.E.R.E.